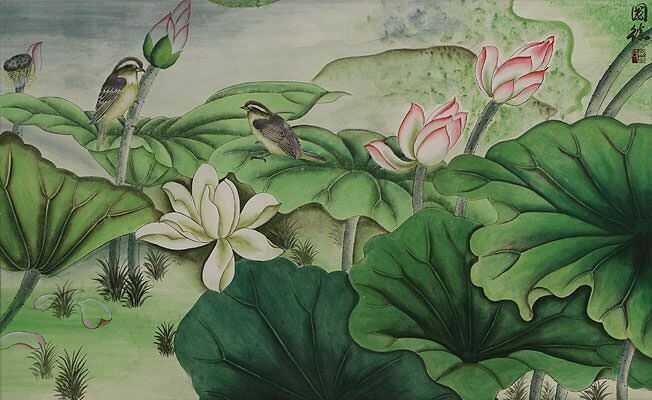 Artwork Panel: 32.1cm x 128.7cm ≈ 12½" x 50¾"
Silk/Brocade: 41.1cm x 186.1cm ≈ 16¼" x 73¼"
This artwork features to egrets enjoying the final blooms of lotus flowers as Autumn arrives. The Chinese title is 留得秋荷聽雨聲 (Liú dé qiū hé tīng yǔ shēng) which is based on part of an old sad Chinese poem about the lotus in Autumn. The artist changed the words slightly to make it uplifting. It reads, "Linger in the Autumn season and listen to the rain." The characters following the title, 辛卯年 建秋, indicate the year painted (2011) and the artist's signature. This painting has a simple muted background style but incorporates a lot of detail in the foreground subject of the artwork. This is a style of Chinese artwork that has been around for thousands of years. 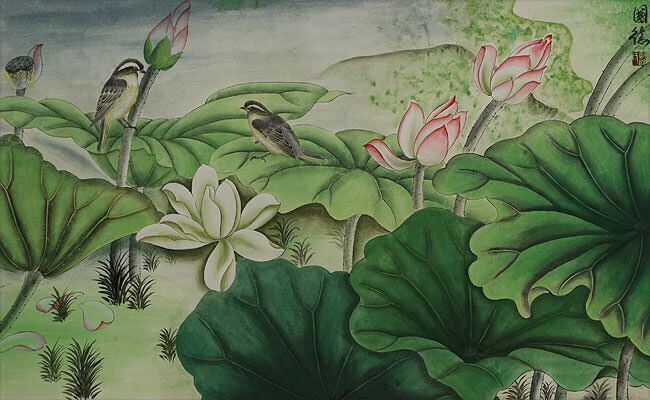 This artwork is completely hand-painted and is mounted to a handmade silk wall scroll in my workshop.